A 67-year-old woman has a 5.2 cm presacral mass. CT examination demonstrates a well circumscribed tumor containing large amounts of fat with areas of interspersed higher-attenuation tissue. A maximal SUV of 2.3 was reported; the lesion showed a slight increase in FDG activity compared to the previous study. Based on the radiographic findings, a presumptive diagnosis of myelolipoma is made. 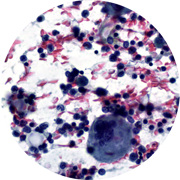 Core biopsy and FNA cytology show mature adipose tissue interspersed with hematopoietic elements resembling bone marrow. The diagnosis of myelolipoma is confirmed.